The Norco Range is a freeride bike that is built for the cyclist who wants to see the world on a reliable workhorse of a machine. It is a bike that is full of character, and has a lot of personality to it. It can climb, go downhill and withstand the worst bumps with no issues. The Norco Range has a very high-end kit on it, and is built to last, that’s for sure. We decided to review the bike and make sure that it was as good as we expected. 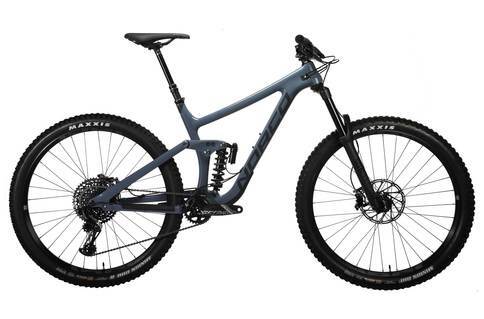 We found that the bike was easily able to traverse even the worst descents on our trails, possibly because this Canadian manufacturer is based in BC. We fell in love with the carbon frame as well as the very awesome RockShox Lyric RC solo with 170mm of travel in the front. We did notice, however, that the entire bike wasn’t carbon. The chainstay as well as the rocker link were both bade out of alloy instead. The tires were probably our only complaint with this bike. The front and rear tires aren’t made out of the same material, which means that it tends to get a bit sticky in the back in some conditions. In addition to this, the SRAM suspension on the front and rear were a little strange as well, sticking and feeling sluggish during our ride. The Norco Range is a bike that is made to make you feel on top of the world during your ride, although it does have certain issues that make it less than amazing. While we did have a lot of good times with the Norco Range, we also felt like it could have been improved a whole lot in terms of ride quality. For a bike priced as highly as this, we did think it was a tad too underwhelming.